Anti-academic selection principals reveal flawed reasoning. Catholic primary school principals from Newry and Mourne have joined the orchestrated effort to dissuade and frighten parents away from tests for academic selection to grammar schools. So where was the operation of this professional opinion for the past 7 years since Martin McGuinness unilaterally announced the ending of regulated 11-plus testing? If the revised curriculum content is taught as required what do principals have to fear except the measurement of their staff’s effectiveness? It appears that “professional opinion” on academic selection changes as frequently as the Catholic hierarchy position and the weather in Newry and Mourne area. It is important that parents are not swayed by the principals’ ” professional opinion” and continue to remember that parents are the prime educators of their children. Perhaps the BBC missed the 2008 announcement contained in a Press Release that NFER Nelson was splitting up. nferNelson, the UK’s biggest independent provider of educational assessment, is announcing at BETT 2008 that it has changed its name to GL Assessment. Parents may ask if they should rely upon the BBC ‘s N. Ireland education correspondent for timely, valid and reliable information. Announcements about the AQE coming together with the anti-selection Catholic Heads Association (CHA) to agree a common entrance test for grammar schools must be viewed with concern and reference to the recent past. In October 2008 the CHA met with Caitriona Ruane, the Education Minister, to view their concerns about the public demand for continued testing. Shortly thereafter the Irish News ran a story with the headline “Exam to replace 11-plus in doubt” Soothsayers indeed. The Catholic Heads Association, which represents the principals of 31 grammars, proposed on Tuesday that schools use this test rather than set their own entrance exams. Although they were fully informed and involved in the AQE it was clear that the CHA wanted no part of any arrangement with the Protestant schools. The CCEA said it would be necessary to undertake a process of research and development to create an adapted test. Given that amended tests would relate to revised curriculum content, there would be a requirement for a new specification, exemplar material and guidance for teachers and invigilators. No specification has been published, the contract for the development of the new test was issued without tender and the Minister announced in February that the test was cancelled. From the CHA perspective all the boxes were ticked. No unregulated Catholic test, no AQE test for Catholic schools and now no regulated test from the DENI. Re-read the first line of this post again. For those who would wish to assess John Gardner’s influence in the current debacle, the following article may help set the context. 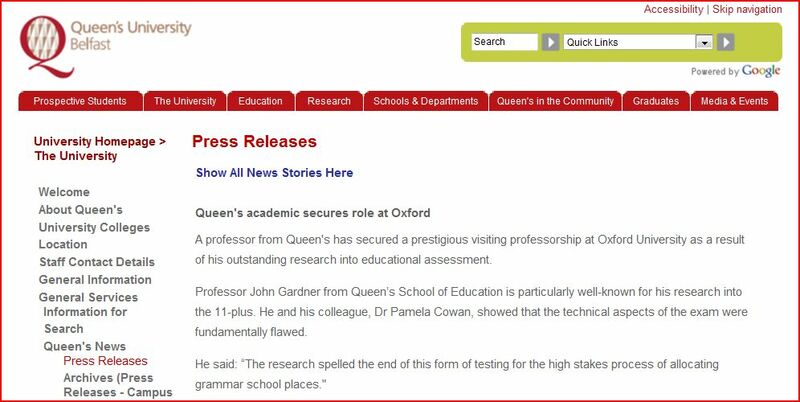 John Gardner was relied upon by CCEA to deliver their proposed changes to assessment culture Note the date! It would appear that the twin ‘fixes’ of AUs and moderation have until recently been considered sufficient to underpin school comparisons. However, in a recent survey (summarized in CCEA 1999d), teachers at both key stages rejected teacher assessment as not being “sufficiently rigorous” as the basis for comparing standards across schools (pp 32 & 34). The same survey recorded key stage 1 and 2 teachers’ appreciation of the role of the AUs in calibrating judgements but also noted their preference for standardized tests as being more useful than statutory assessments. Level descriptions were also endorsed as being useful for teachers but their wording and numerical scoring were felt to be unhelpful to parents or for indicating a pupil’s individual progress in relation to the peer group respectively. The prospect of a return to local governance of education is awaited throughout the Northern Ireland system with some anticipation. It has been argued in this paper that for several decades now, there has been very much a ‘follow my leader’ approach. This will not dissipate completely, nor should it. Much has been learned from our neighbours and there is clearly much more to be learned. One difference will certainly be the exercise of choice in what happens in Northern Ireland education. the assessment of interpersonal negotiating and conflict management skills. WHERE IS THE SUPPOSED IMMORALITY OF ACADEMIC SELECTION FOR THE CATHOLIC CHURCH TODAY? The announcement by the Catholic Commission on the limited use of academic entrance tests for Catholic Grammar schools raises a fundamental question about the Catholic Church’s position on academic selection. The NICCE representing the Catholic bishops and leaders of religious congregations as trustees of Catholic schools has reversed a previous position by the Northern Bishops. The reluctant blessing from the bishops for academic selection to continue goes against warnings of legal perils from Caitriona Ruane, the Education Minister and is the outcome established in a bid to agree on a joint way forward for the Catholic sector. However the new policy on post-primary transfer for Catholic schools suggests that all schools should stop using academic selection no later than 2012. This position is nonsense. “Academic selection, which is a fundamental principle and practice for grammar schools, is being used as an instrument of convenience by the Catholic Church and education system hierarchy. There remains a fundamental flaw in the Catholic hierarchy’s thinking on the matter of academic selection. The Church leaders fail to acknowledge that parents want academic selection as the first criteria for admission to grammar schools. Parents wish, in consultation and with quantitative information, to choose schools for their children not for schools, educationalists, the DENI or politicians to choose those schools for them or remove them from existence. “In this context, as the legal Trustees of Catholic schools in Northern Ireland, we do not approach the current debate about the future of education here from the point of view of any particular political philosophy or administrative policy. While some have sought to claim the support of the Catholic Bishops for their approach to the current debate, we have scrupulously avoided endorsing the perspective of any political party or specific structures to replace the 11+.